The cobblestone streets of Regensburg. We've now been home for almost a week and I still haven't given you the last instalment of our German adventure. 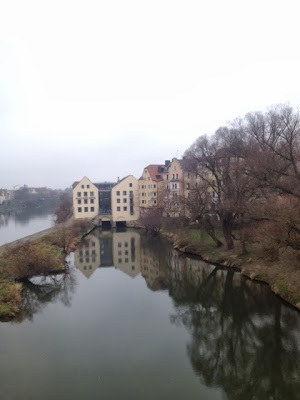 We headed north from Munich on the train to the town of Regensburg – an important trading centre during the middle ages. The town is very special as it was the only major town that didn't suffer significant damage during World War II, so it was named a UNESCO Heritage site in 2006. 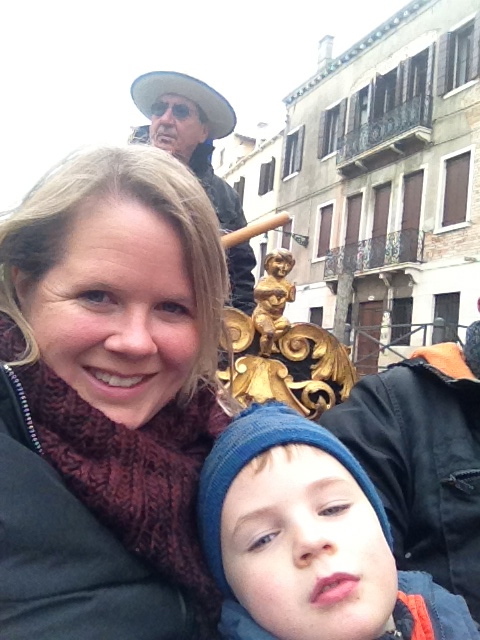 The gorgeous village with it's narrow lane ways and cobblestone streets enchanted me. The buildings were gorgeous and so old! 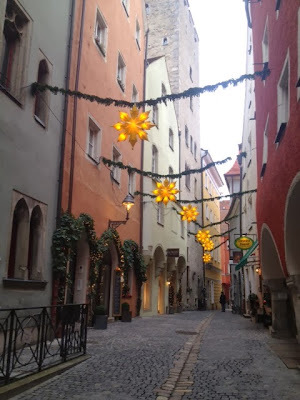 We had a brilliant time wandering around the town, stumbling on small squares filled with a Christmas market. We ate more sausages on rolls and down more gluhwein. The kids munched on apple fritters and pastries too. On our last day we lunched at a small restaurant on the banks of the Danube called Wurstkuchl. 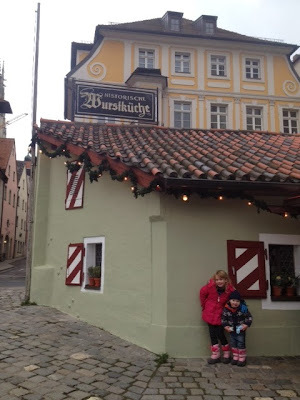 It's a sausage restaurant that has continually served up bratwurst, sauerkraut and rolls with sweet mustard for 900 years! It started serving food to the builders of the old stone bridge nearby. It was cozy, the food and beer was fantastic and we met some lovely German people who shared our table. The best end to our adventure. I totally understand why this place has been operating for so long. Our last day arrived, we had a couple of kilometre walk to the train station that involved navigating some steep steps. We looked out and the sun was shining, it was difficult to catch a cab so we thought we'd chance the walk. We set off and after about 5 minutes it started to snow. It hadn't snowed the whole time we were in Regensburg. As I looked behind me on the Stone Bridge, I saw a flurry of snow coming our way and soon we could barely see. 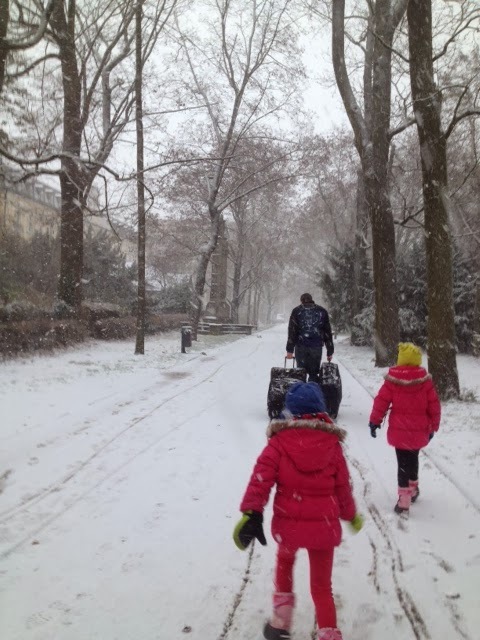 The girls ran around excitedly, Darbs in the stroller yelled at the snow blowing in his eyes and ears. We pushed on through the white and eventually reached the train station. As we stepped inside the station the clouds rolled away to reveal blue sky and the snow storm blew away. Typical! We then wait for our train and waited. And waited. We waited 45 minutes before it pulled into the station. So much for the punctuality of German trains! I have to say we had more than a couple of late trains while we were there, so I'm starting to think it's a myth. We started to get a little panicky about catching our flight, the snow had started to come down again and we still had a bus to catch to the airport after our train ride. We needn't have feared, we made the bus and got to the airport just in time. Just in time to be told our flight was delayed. We boarded our flight an hour late and then sat on the plane for another 3 hours due to technical issues and de-icing. By the time the plane had taken off we should have been almost touching down in Dubai. After more technical issues once we arrived at Dubai airport we didn't arrived home until almost 4.30am. Kids hadn't slept and were pretty feral. I was pretty feral myself. It was good to be home, to sleep in my own bed, to be back in the warmth and the sunshine. Cold is fun for a week, but it's nice to get back to sunshine. Also, dressing the kids in all those layers was starting to do my head in! Give me sundresses and shorts any day. We had such a brilliant adventure despite a few hiccups. It's so good to have these adventures as a family and although there are moments when you want to kill each other, the good memories always override the bad ones. While I was ready to swear off overseas travel this time last week, I'm already starting to wonder where we will head next. Trudging to the train station. 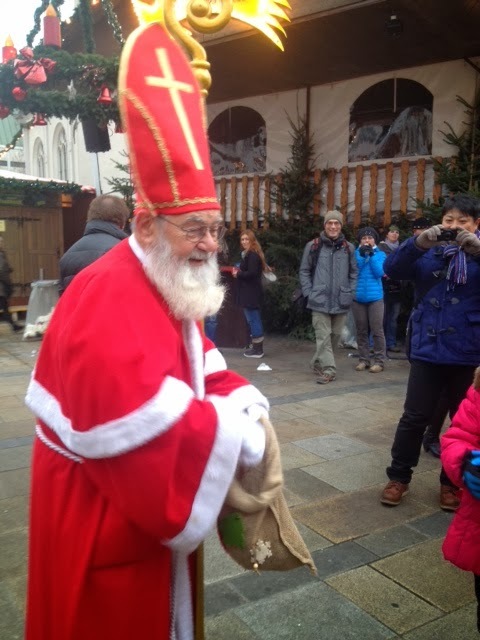 Meeting old Saint Nick at the Christmas markets.